English glass of the early eighteenth century was plain with the Queen Anne taste for simplicity clarity, and as such there was no for applied decoration. Several factors saw this change including a period of peace with the Treaty of Utrecht, which was signed in 1713, and led to an opportunity for the glasshouses of Silesia, Bavaria and Prussia to increase their exports to London. 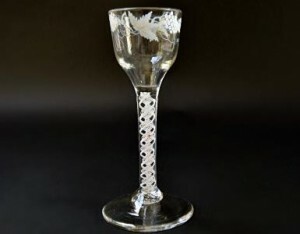 The passing of the Excise Act of 1745, whereby glass was taxed by weight, led to growth of drinking glasses of slender proportions, using smaller bowls of curved profile on air-twist stems (cotton twists, opaque twists), sometimes combined with white or coloured enamel twists. The reduction in the content of lead in the metal deprived it of the deep glow of the earlier body, and there was a move to applying decoration in the form of engraving, gilding and enamelling. Pictured: Bonhams Beilby Goblet Record Price at Auction. 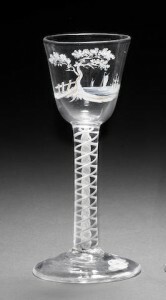 The Prince William V Goblet. A highly important Beilby enamelled and gilt Royal armorial Goblet, circa 1766 The deep round funnel bowl painted in colours and gilding with the arms of the Nassau Princes of Orange encircled by the Garter and surmounted by a crown and mantling, the lion supporters on a ribbon bearing the motto JE.MAIN.TIEN.DRAY, the reverse with a white butterfly and floral sprig beneath the signature in red, traces of gilding to the rim, set on a multi-knopped stem and conical foot, 30.2cm high Signed Beilby Newcastle pinxit in red enamel. Sold for £109,250 inc. premium at Bonhams, New Bond Street, November 2011.The art of enamelling had long been familiar in Ger­many. The process required a paste combining equal parts of lead and tin, together with colouring matter, mixed with a flux and an oil medium. This prepared enamel was then painted on the glass, fired at a low temperature and reannealed by allowing the enamelling furnace to cool gradually. 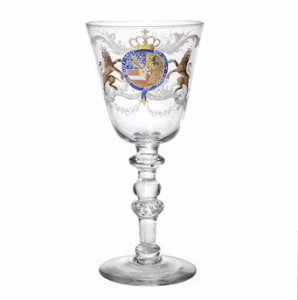 German glass was harder than the English metal and more suitable for enamel decoration as the colours were less likely to flood in the firing, but the reduction of lead content in English glass following the Excise Act made it a readier vehicle. Sold for £6,875 inc. premium at Bonhams, London, May 2013. Sold for £8,750 inc. premium at Bonhams, London, May 2013. This enamelling method was used by William and Mary Beilby of Newcastle who adopted the technique, worked entirely in the tradition of German independent decorators or “hausmaler” by purchasing plain vessels from the glasshouses of their home town and decorating it in their home. The style of their work was entirely individual and belongs in spirit to the English interpretation of Rococo. A Beilby enamelled wine glass painted with a shepherdess, circa 1765 Sold for £1,250 at Bellmans, June 2016. William Beilby (1740–1819) was the fourth child of a Durham jeweller and goldsmith William Beilby Senior. One of a family of seven, William was placed as an apprentice with a Birmingham enameller in 1755 and while he was there the family moved to Newcastle. A younger brother, Thomas, went to Leeds where he found employment as a drawing master and is later recorded as having his own aca­demy. When William returned, perhaps in 1761, his father was still in business, while a younger brother, Ralph, and his sister Mary (1749–97), were also at home. Ralph was an engraver and earned a reputation for his industriousness and his willing­ness to undertake any type of engraving. In particular he was an heraldic specialist and engraved coats-of-arms and crests on silver. Thomas Bewick, whose exquisite wood engravings were later to reveal a sensitive and poetic artist, was apprenticed to Ralph in 1767 and lived in the Beilby home. It is, in fact, to Bewick’s memoirs, written many years after his life with the Beilbys, that we owe so much information about the family. Be­wick states that both William and Mary had “constant employment of enamel-painting on glass,” and while William also taught drawing in the town, he evidently instructed his young sister so that she could help him in his enamelling. As well as armorial decorations, there are examples of landscapes painted in colours to which Mary may well have contributed and also a series painted in white enamel with flowers, avian motifs or picturesque scenes of ruins and figures. The enamel of these monochrome decorated pieces has a faintly bluish tinge. Of the type of wine-glasses chosen for decoration, the bucket-shaped bowl provided the larger surface for painting, but small glasses with straight-sided or ogee bowls and straight stems containing white enamel twists, are also found. The series continued probably until 1778. Mary is known to have had a stroke in 1774, while the household was probably broken up by Ralph Beilby and Thomas Bewick going in to partner ship three years later. Mrs. Beilby died in 1778, when William and Mary evidently gave up their workshop and left Newcastle for Fifeshire. 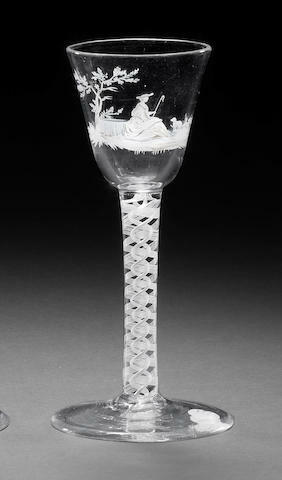 By this time English glass had abandoned the Rococo manner and the moment for such individual achievement was over.